In conjunction with the National Civic Day of Hacking, the Southwest Florida Regional Technology Partnership (RTP) hosted its second annual Hackathon, beginning Friday, June 5 through Sunday, June 7. The goal of National Day of Civic Hacking is for residents, community groups, and government to collaborate to make their communities stronger. Specifically, the southwest Florida event offered teams to select from two themes - Blue Zones Project and Safe Firefighting. All the teams produced viable solutions, but in the end Team Breakroom was triumphant. They created a Fire Response Environmental Detection System that is an all in one inclusive data collection device in The FireCloud (which assures a standard interface layer that unifies multi device communications to a standard code). Team Penta Sensation from Dunbar High School focused on Safe Firefighting creating the PentaSensor housed in a ball-shaped casing that would be thrown into a fire that sensed and transmitted information to a central database regarding the environment the firefighters were entering. Team Arduino Fighters wanted to help firefighters with their safety by creating a small, portable sensor that is placed in the helmet of the fighter and then transmits data to a central database. The team from Fort Myers Technical College (FMTC) focused on both themes. FMTC Fire created LiveSense, a firefighting data collection platform that utilizes the IBM/Watson Analytics Platform to help analyze the forensic data to determine best course of action in a fire and can be utilized on a macroscopic scale. For FMTC Health they created an app called LL Ally (Long Life Ally) which keeps participants honest with their health assessment tracking. The Blue Men Tech Tag Team earned honorable mention for creating an app called the Longer Life Challenge Game based on three elements; 1. Education 2. Action 3. Community. This app takes the 9 principals of the Blue Zone and gamifies the elements so people can play individually or engage socially on various levels that people find inspirational and fun. The RTP Hackathon was supported by several organizations including sponsors LANDESK, Zuora, Chico's FAS, IBM, Kuniter, Hodges University, IAFF Local 1826 and the Lee County Economic Development Office. 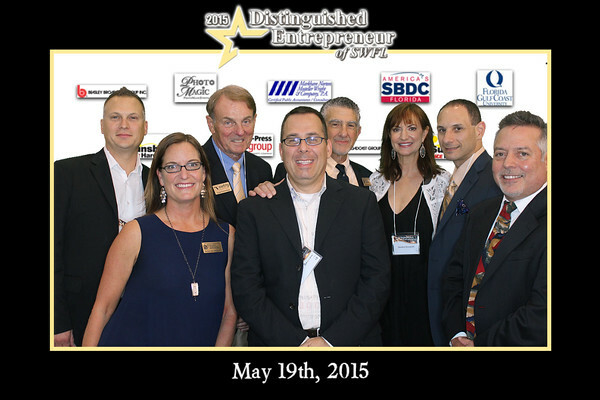 The SWFRTP Board had great representation at our partners', the FGCU SBDC Distinguished Entrepreneur Award Dinner, May 19th at the Coconut Hyatt in Estero, FL. SWFRTP values the work the SBDC does in our community to develop companies and coach entrepreneurs to grow in the region. The winner this evening was Gary Mart of Global Tech LED, LLC. Gary started Global Tech in 2008 in Naples, FL. His idea was to create a LED light that fit multiple light fixtures, a concept called retrofitting. With wattage levels at 60-1000 watts, the lighting is well suited for industrial uses like parking lots, roadways and warehouses. Well done Gary!! We would like to announce the awards winners from our Seventh Annual Awards Dinner, sponsored by Adecco, Chico’s FAS and Zuora, CenturyLink and 21st Century Oncology on March 25th. This year at Southwest Florida’s longest running, “Excellence in Technology” event there was record breaking attendance to congratulate the finalists and hear David Trimm, former CIO at The Hertz Corporation, speak to “The Five Technology Trends You Can’t Ignore.” Thank you everyone for supporting the continued growth of our organization as we celebrate technology in the SWFL region. Winner of the inaugural Women in Technology Award to recognize contributions made by women in technology through professional expertise and leadership is Denise Spence with Dunbar High School. Spence runs the information technology program and teaches there, as well as serving as an adjunct professor at FGCU. Other finalists were Jodi Harrison with Interactyx and Tracey Lanham with Hodges University. For the Transformation Award, for a business that has achieved success through implementation of IT to overcome a challenge, the winner is Ted Todd Insurance for the work they did developing customized applications for automated quote responses. Other finalists were the Canterbury School and DeAngelis Diamond Construction. The Innovention Award is given to a company that has invented or demonstrated an innovative and creative technology solution and MassiveU has created a whole new way for teachers and students to interact, learn and develop online. Arthrex and SkyLink Data Centers were the other finalists. Another new element to the dinner was a $500 scholarship given to freshman Christian Irving for higher education. Christian won the Thomas Alva Edison Regional Science and Inventor’s Fair for his device that is built into the sole of a shoe to charge mobile devices. Join Florida's SBDC for the fourth annual Distinguished Entrepreneur Awards and Dinner presentation to recognize and celebrate the spirit and the success of entrepreneurs throughout SW Florida! Guest Speaker will be Michael Wynn. Michael is a native of Naples, FL and Chairman of the Wynn Family Board of Directors and President of the chain of Sunshine Ace Hardware stores. He has spent his career working to honor the tradition of community involvement and customer service his family began back in 1938 when they first arrived in Naples. Michael is a committed volunteer in the business and civic community of Southwest Florida. He is the Immediate Past-Chair of the Greater Naples Chamber of Commerce, Co-Founder of the Partnership for Collier’s Future Economy; served as a Trustee for the YMCA of the Palms; was recognized in 2009 as one of Gulfshore Busin ess’ Forty under Forty; received the 2010 Chamber Volunteer of the Year Award, and was also the 2010 YMCA Volunteer of the Year. The culture of innovation and values that Michael has fostered at Sunshine has been recognized locally and nationally. He was a 2014 state finalist for the Ernst and Young Entrepreneur of the Year award; received the National Retail Hardware Association’s Top Gun award in 2014; and is a recipient of the Uncommon Friends Award for Business Ethics. He is a member of the SWFL Junior Achievement Hall of Fame, a proud member of Vistage, a 2008 graduate of Leadership Collier and a 2012 graduate of Leadership Florida. Michael holds a bachelor’s degree in business administration from the University of South Florida and an MBA from Florida Gulf Coast University. Michael and his wife Paula have two daughters, Sydney and Olivia. The Innovention Award. Awarded to a Southwest Florida organization that has invented, improved or demonstrated an innovative and creative technology solution or product that created business worth by saving money, improving efficiency, reworking a business process or generated a completely new way of doing business. The Transformation Award. Awarded to a Southwest Florida organization that has achieved success through the application or implementation of an existing technology in an innovative manner to overcome a business challenge. Woman in Technology Award. Recognizes the success and contributions of a woman to the technology industry of Southwest Florida through professional expertise and leadership. The recipient will exemplify the commitment of the partnership to a vibrant community of technology professionals and opportunity for all.